It's the most wonderful time of the year, except for agency people who've been feeling the annual pressure to come up with something fun for their agency holiday card. How did they do this year? Check out some of the more notable efforts below. We'll be updating this post over the coming days. So, email us your card, and if it's any good, we'll try to include it. AMP tells us: "Instead of a desk calendar of our pets in human clothes (which was considered at length), we thought we should send something truly AMP to show our appreciation. 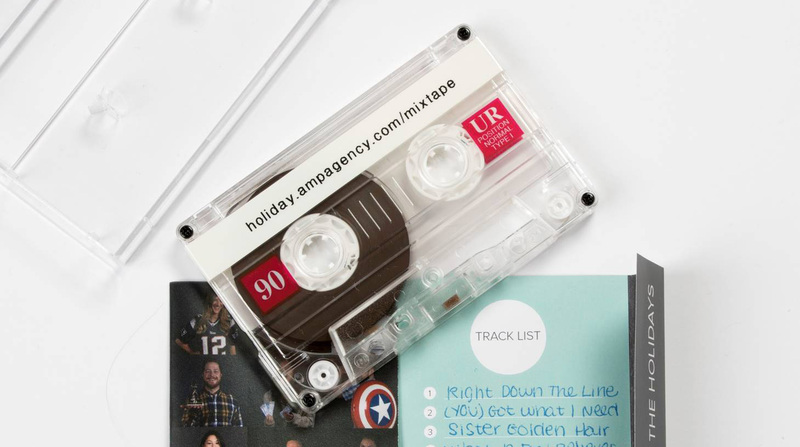 So, we decided to share our affection the best way we know how: with a mixtape. The mixtape includes AMP's deep cuts, the jams that powered us through the last 12 months and pump us up for what's to come. May the songs that inspire us bring inspiration to you. We hope your ears enjoy." Physical copies were sent out, too—hopefully with a cassette player included. All four offices of Campbell Ewald came together to create a video showing the universal sign for peace. The agency tells us: "Since we're so awash in data these days, it's not enough anymore to just express a sentiment, we have to back it up with cold, hard facts. That's why we created the Holidata All-set Card Set. 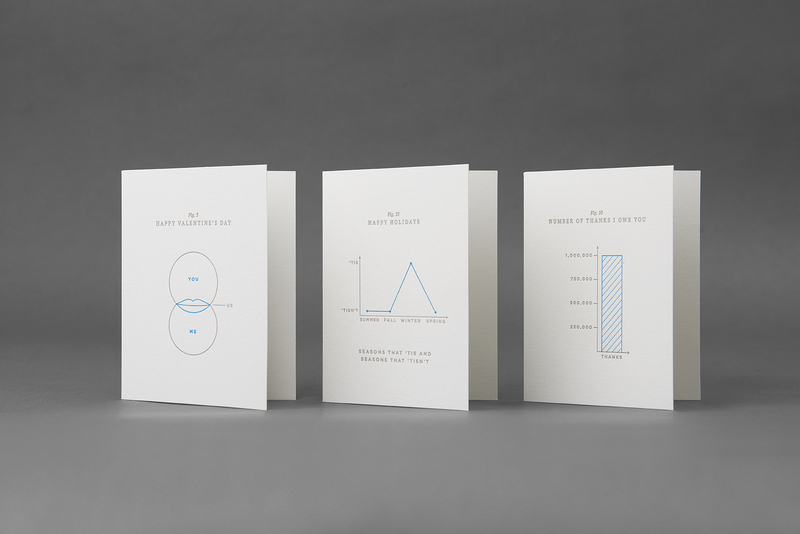 These eight, beautifully designed letterpress cards were made to not only show how much you care, they prove it with fun analytics, graphs and figures, all too familiar to the marketing world." This agency created a temporary Chrome extension that removes potentially polarizing content from your Facebook feed and replaces it with actual polar stuff—as in the North and South Pole. "Tired of Trump, Hillary, and seemingly endless arguments about every little thing? Trade all that for some penguins and narwhals!" the agency says. When Santa is your client. Not a new idea, but a fun spin here from DiMassimo Goldstein. 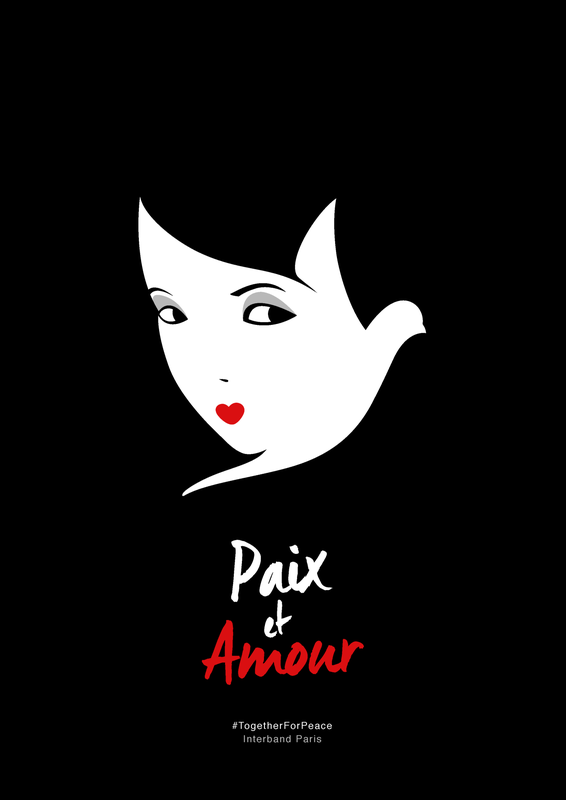 In the wake of the recent events in Paris, Interbrand was struck by how the the traditional message of peace at the holidays is even more charged with meaning this year. So, the agency challenged each of its offices around the world to create a visual representation of what peace means to them. See the posters and behind-the-scenes footage at interbrand.tumblr.com. How much good can you do with $10? Legacy Marketing launched a social experiment to find out this holiday. Check it out at 10bucksofgood.com. "Tis the season to step up your text game." 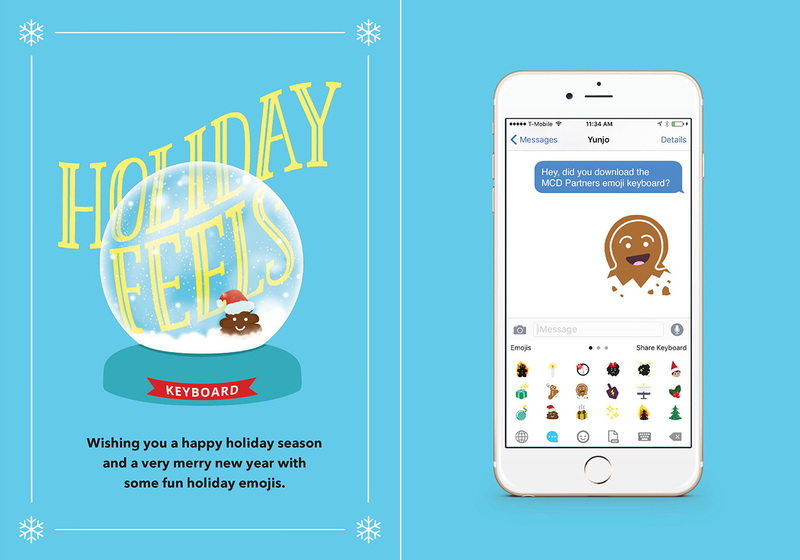 So says MCD Partners, which has posted its Holiday Feels Keyboard in the App Store. Get ready to "send plenty of season's greetings, jolly gif and merry messages. You'll be Ho Ho Ho-ing and Ha Ha Ha-ing all over the place." Mekanism Holiday 2015 : As Seen On TV. "As seen on TV! It's the latest, newest, biggest, brightest holiday video for everyone on your list!" Mekanism says. The agency gives us a little more background on the concept: "The vignettes were inspired by: daytime dramas, tech startups, televangelist broadcasts, avante garde art films, bad magic shows, and even early '90s workout apparel … they are all so bad and yet at the same time, so wonderful. If you dumped them all into a holiday snow globe, added Mekanism employees across three offices and shook it really hard, you would get this film."